Tuesday was my last day of the second nine week cycle of chemotherapy. Phil and Kelly joined me. It is such a relief to have the pump removed and not have to carry it around day and night. It was great to say good bye to all the hard-working nurses that have been helping me for the past few months. To celebrate, I made dinner for Kelly, Kim, Goldie and Myrna. 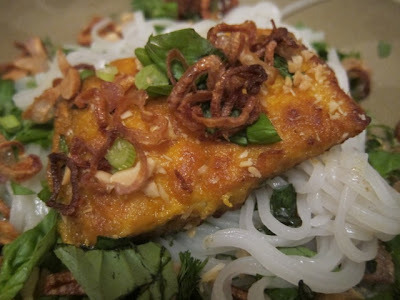 It's a new favorite, at Wong, a new place in the West Village they call it Cha Ca La Vong. I sautéed mahi mahi that had been dredged in flour, turmeric and salt. Put it on top of rice noodles with basil, cilantro, dill and scallions. It's topped off with some fried shallots and peanuts. There is also a light sauce of lime juice, fish sauce, chiles and garlic. I'm still learning how to eat without a stomach. Mainly I need to eat very small portions very slowly to avoid pain. Now that I'm done with chemotherapy my goal is to gain weight. I have a PET scan scheduled next month that will show if we've gotten rid of the cancer. I'll keep you posted. We're happy that you're done with the chemo. We need to get to the East to see you. That dinner looks delicious. I'll have to try it. Is that off the cuff or do you have a recipe? Tina and Bowie say hi and that we're thinking of you. Can't wait to see you in Dec! so happy your chemo is done. fish looks tasty. Did you know that you can shorten your long links with AdFly and get cash from every visit to your shortened urls.